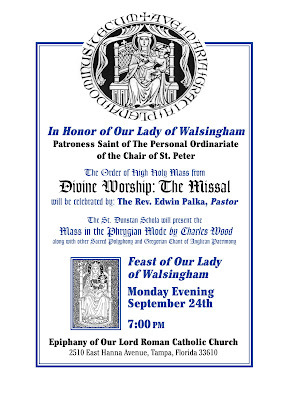 On Monday, September 24th, Fr Edwin Palka of Epiphany of Our Lord Catholic Church in St Petersburg, Florida, will offer Mass according to Divine Worship: The Missal for the feast of Our Lady of Walsingham, in pastoral response to some canonical members of the Ordinariate of the Chair of St Peter. This will be the first Mass of its kind in the Diocese of St Petersburg. While Epiphany of Our Lord was designated as the center for the Traditional Latin Mass by Bishop Emeritus Robert N. Lynch in 2015, the celebration of the Mass according to the rite used in the Ordinariate is in absolute continuity with the mission statement of the parish, which is (in part) “to encourage all men to be fully, faithfully, joyfully and unapologetically Catholic in all aspects of life; and to bring about, through the mercy of God and the intercession of the Blessed Mother and all the Saints, the conversion of sinners and the salvation of souls.﻿” It is our hope that this Mass will contribute to the sanctification of our parish and diocese, and whose grace will lead the Church Universal to greater unity. The church is located at 2510 East Hanna Avenue; the Mass will begin at 7 pm. 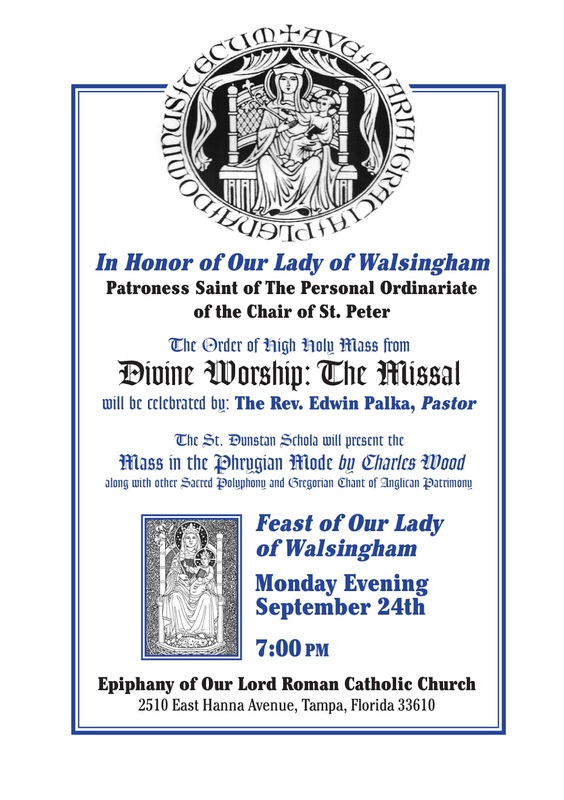 On the same day, September 24, the Cathedral Basilica of Ss Peter and Paul in Philadelphia will host a solemn Mass offered according to Divine Worship: The Missal for the feast of Our Lady of Walsingham. 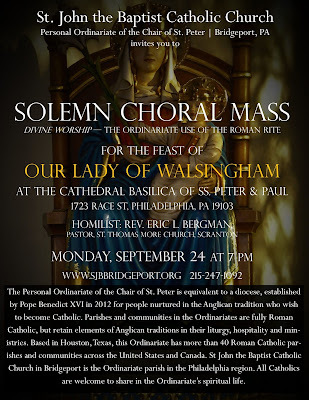 Fr David Ousley, pastor of St. John the Baptist Church in Bridgeport, the Ordinariate parish in the Philadelphia area, will celebrate the Mass, with the assistance of Fr Eric Bergman as deacon and homilist, and Fr Albert Scharbach as subdeacon. The faithful will be able to hear sacred music from the Anglican tradition, including Oldroyd’s Mass of the Quiet Hour, motets by Elgar and Stainer, Anglican chant, and a chancel choir rendering English adaptations of the Gregorian Proper antiphons. Clergy and seminarians are most welcome to attend in-choir. 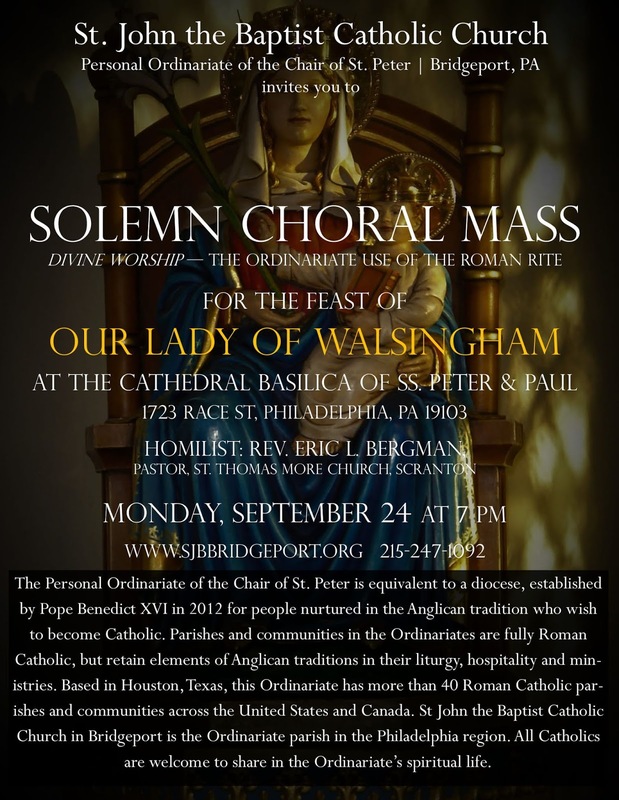 The Mass will begin at 7pm, and be followed by a reception; the basilica is located at 1723 Race Street. 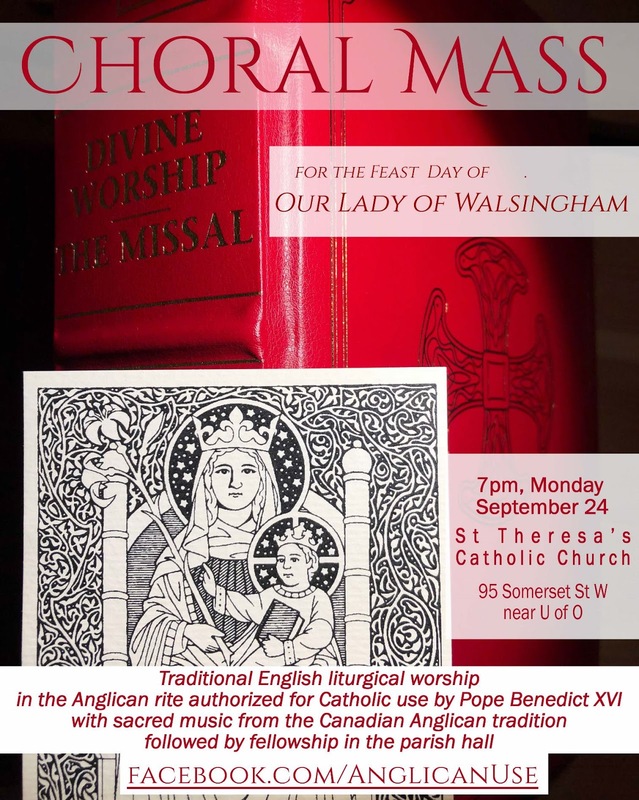 St Therea’s Catholic Church in Ottawa, Ontario, will keep the same celebration in the Ordinariate Rite, also starting at 7 pm. The church is located at 95 Somerset Street West.